Retail sales statistics for the U.S. economy are regularly compiled by the Census Bureau. However, there is no readily-available, timely source of data for retail sales on the state level. One approach to filling this gap is to use state sales tax collections as a measure of taxable sales. In principle, the approach is quite simple: Taxable sales = Sales tax collections/tax rate. In order to extrapolate sales statistics from tax data, however, it is necessary to consider the coverage of the tax, changes in tax law, and the timing of state revenue collection relative to the underlying sales. Arkansas has four separate sales taxes imposed on a common base: a general sales and use tax of 4.5 percent, a tax for the educational adequacy fund of 0.875 percent, a property tax relief tax of 0.5 percent, and a conservation tax of 0.125 percent (for a total tax rate of 6.0 percent). Each of these taxes could conceivably be used to identify overall sales activity. However, recent changes in tax structure complicate matters. In particular, the tax rate on grocery purchases was lowered from 6.0 percent to 3.0 percent in July 2007, then lowered again to 2.0 percent in July 2009. When these tax cuts were adopted by the state legislature, the associated revenue reductions were specified to be subtracted from three of the four specific taxes, in proportion to their relative rates. As a result, these three taxes (general sales and use, educational adequacy, and property tax relief) no longer represent a constant fraction of total sales–rather, they represent a weighted average of taxes on non-grocery items (at the statutory rate) and taxes on groceries (at a lower rate). Only the 1/8-percent conservation tax remains at its statutory rate. (The conservation tax is not affected by recent tax law changes because it is written into the state constitution.) The conservation tax is therefore a unique candidate for use in estimating the underlying tax base. A second important factor for deriving sales information from tax collection data is the timing of tax receipts relative to the sales being taxed. Tax laws in Arkansas impose different requirements on different sized businesses. Some larger firms can choose to pay estimated taxes for the current month, while some smaller firms are required to file and pay only quarterly or annually. For most business, however, the key deadline comes on the 24th day of the month. On that date, final statements and payments for taxes owed in the previous month are due. The tax payment deadlines suggest that revenues received by the state during a month primarily reflect taxable sales from the previous month. An examination of the raw data supports this timing convention. For example, when the special conservation tax was implemented in 2001—and again when the earmarked educational adequacy tax was introduced in 2004—revenues received in the first month of implementation were a very small proportion of subsequent months. The seasonal pattern of sales tax receipts is also indicative: The most prominent recurrent peak in tax receipts occurs in January, one month after the December retail sales peak. As the payment regulations indicate, tax receipts reflect a mix of taxable sales from current and previous months. Nevertheless, the best practical estimate seems to be a simple one-month lag. Although there is a great deal of month-to-month variability in this measure, recent observations suggest that sales activity reached a low point around mid-2009, with signs of recovery since then. 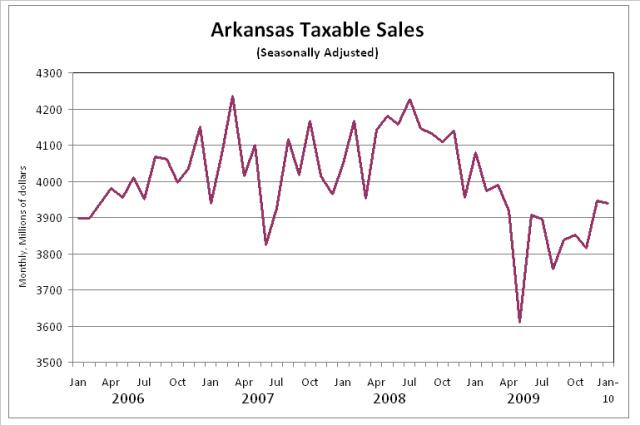 The series is labeled “taxable sales” rather than “retail sales” because Arkansas sales and use taxes apply not only to retail transactions, but also to some business-to-business transactions. Some of the monthly variability in the series can be attributed to specific institutional factors in the tax collection process. For example, the rather sharp upturn observed for December 2009 (reflecting tax collections in January 2010) was partly attributable to “one-time gains from audit payments” [see General Revenue Report for January (FY 2010)]. The most recent observations in the series should be considered preliminary. Data for the conservation tax are not explicitly reported in the General Revenue Reports, but are available in the publication Arkansas Fiscal Notes, which is available a few weeks after the initial report. Until the publication of Arkansas Fiscal Notes, the change in general gross receipts is used as a preliminary approximation. Given some of these considerations, it is best not to focus on very short-term changes in the data. The chart below shows the results of averaging the data over calendar quarters. 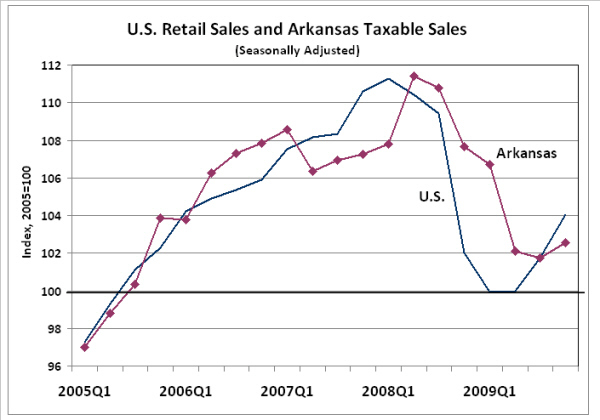 The chart juxtaposes Arkansas Taxable Sales with a quarterly measure of U.S. retail sales. Sources: U.S. Census Bureau, Arkansas Department of Finance and Administration, Institute for Economic Advancement. A comparison of the measures for Arkansas and the U.S. reveals an interesting pattern: Sales in Arkansas reached a peak about one quarter later than the U.S., and experienced sharp declines with a similar lag. Moreover, the percent change from peak to trough is smaller for the Arkansas data than for the U.S. 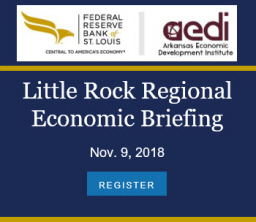 This pattern is consistent with the notion that Arkansas’ economy was dragged into recession by economic weakness in the rest of the country. Both measure show increase toward the end of 2009, confirming the general observation that both the national and Arkansas economies are beginning to recover from the recession of 2008-09.